How will they hear without attraction? Does the Bible teach that we must attract unbelievers for them to hear the gospel? Especially if we will use "good things" to do so? I contend that, according to Scripture, not only does attraction have nothing to do with the unsaved hearing the gospel, but that God is against it. Jesus or the Apostle Paul didn't use it and both of them opposed it. The Antichrist and the False Prophet, however, during the tribulation period will use attraction as a means of propagating their message. I also believe that the use of attraction is symptomatic of shame for the gospel. To start, let's consider 1 Corinthians 1. There were divisions in the church at Corinth, not based upon scriptural matters but upon unscriptural and non-scriptural ones. People were accustomed to chasing after men with either wisdom or who did signs, both of which were extra-scriptural attractions. And so these were implements that men used to attract men---they worked. The Greeks popularized philosophy, what is called wisdom in the second half of 1 Corinthians 1. Of course, it wasn't the wisdom of God, true wisdom, but the counterfeit wisdom of Greek philosophy. Schools revolved around men who people thought were really smart, impressive talkers. And they attracted people with their impressive sounding speeches. Someone might be tempted to use wisdom as a basis for tickling the ears of those who were mainly allured by intellectual bait. On the other hand, some needed experiences, signs, what was more feeling or emotionally oriented. They wanted to be 'wowed,' shocked, or awed by the unexplainable. The Jews were uniquely susceptible to this kind of attraction, perhaps because God Himself had used signs as a basis of identifying Himself to the Jews as a fulfillment of prophecy. God would say, "I'm going to do this." And the 'this' was something that only God could do. So they would look for that particular event, and it would be a way for God to verify that it was indeed His man or the promised Messiah. The real signs were of varying degrees of arousal to the senses, from a heavenly host singing and praising God as they hovered in the Palestinian sky or a babe wrapped in swaddling clothes. Tongues were one of these signs, and so Corinthians started speaking in a kind of gibberish to impersonate actual unknown languages. We see the same in the Charismatic movement. However, it could be any kind of experience to garner attention, like a statue of Mary with tears or a sculpture that bleeds. Fake healing. Whatever. It isn't as though these two categories, mentioned in 1 Corinthians 1:22, were all that could be comandeered for the use of attraction of people. Men are vulnerable to deceit because of depraved hearts. They are prone to the pride that wisdom attracts and the lust that signs entice. That's not all there is to the teaching of 1 Corinthians 1, however. Paul spends a long section dealing with the subject at large from 1:18 to 2:16. He confronts more than just division, but he goes after the particular methodology that is used that preys upon men's selfishness. The only permissible, God-ordained attraction for men is the gospel itself. Paul explains that in 1 Corinthians 1-2. Why only preaching the gospel, despite the fact that it "won't work"? And Paul essentially says that. He says that the gospel is foolishness to men. And we know that too, which is why we often act like we're ashamed of it ourselves by reverting to the natural attractions that Paul denounces in these two chapters. He knows that men will continue to favor their own techniques and strategies because of their successfulness. Paul answers the question. Preaching glorifies God and it is all that really does change natural men. To the Jews, preaching was a stumblingblock. Why? It was weak. They wanted a strong looking, Saul-like conqueror, somebody taller than everybody else, who could whip up. To the Greeks, preaching was foolishness. Why? It was stupid. You had to make an intellectual leap to think that the way out of your sin and difficulties was through someone dying. Death was not a likely way to save anyone. So preaching doesn't work. It's not attractive. We know that. And so we've used our own kind of wisdom and signs to attract. And now preachers are saying, "How can they hear without attraction?" They're right. People won't be attracted by preaching. So God chose it. Why? Because it is the power of God. Preaching in the end glorifies God, and that's why we shouldn't use attractions, even if it is a Messiah sing-a-long, the particular promotion that we used as an illustration in the first post in this series. The Messiah sing-a-long makes sense. It's got Christian connections. So does a conservative speaker. Get Dan Quayle or Sarah Palin to make a conservative speech with conservative values, draw a crowd, get them on your side, and then spring the gospel on them. Or maybe a popular sports figure who is respected for his heroic athletic prowess. He could bring in people who love sports and make it easier to see people saved. All of those ideas make sense to people for various reasons. But God has chosen the weak things of this world. We shouldn't then choose the things the world is impressed with as a means of moving it. God isn't glorified in that. He wants an unexplainable success. That's what all the rest of 1 Corinthians 1 is about. But you might say, "I'll praise God for the good results after the sing-a-long; I mean, I'll give Him credit." Right. And what will it all mean? More sing-a-long promotions and it will be the latest fad to be packaged and put into a conference workshop---another manmade concoction for you to try. Because Paul wanted to avoid attractions, he came to the Corinthians without excellency of speech (1 Corinthian 2:1). Excellent speech seems about the most innocuous attraction that someone could utilize. He was in Greece. Corinth was in Greece. And so he went the opposite of what attracted them. They liked impressive speech, so he gave them bland. He spoke the right content, but he wasn't trying to spice it up. He wanted God to receive the glory, so he was careful not to use a human strategy, even something that to us is as innocent sounding as excellent speech. Instead, he came in weakness, fear, and trembling. Wow. That's attractive. Some might say, "Well, Paul used attraction on Mars Hill, you know, with the Athenians." No. Wisdom hadn't worked for the Athenians. They still didn't know God. They had an altar built to the unknown God. Wisdom had gotten them nowhere. So what did Paul do? He went and gave them more wisdom, just doubled down on the wisdom. No. Paul gave them revelation. He preached. That's what he did. With preaching, they could know the God that they didn't know. And in the end, preaching gives glory to God. The Athenians didn't need wisdom. They were natural men. They needed the strategy of God. They needed what the Holy Spirit alone could do. And that's preaching. We don't do better to mix some human technique with God's methods. The medium will change the nature of the message and the results will stand in the power of men. We don't want to provide what Jesus said a wicked and adulterous generation seeks after (Matthew 16:4). And wicked and adulterous could go for Greeks or Jews, when they seek after something other than God. We want our methods to stand in God's Word, so that He gets the glory. I thought the Messiah sing-a-long was a perfect opportunity to talk about this, to ask the question that is the title of this post. And then we should go from there, thinking about all of the workshops and seminars in conferences on every program there is in churches to lure people in. And some of the people that are publishing most in principle against this kind of thing are some of the big violators of their own teaching, like John MacArthur. Some may think I have something against Him. I don't. I've read and been helped by his materials. However, this among other errors, needs to be pointed out, because he is very influential. And this is also an inconsistency in practice. What he tells everyone else to do he needs to do himself. And these kinds of programs are not just the domain of Rick Warren, Jack Hyles, and revivalist fundamentalists. So does John MacArthur and so do fundamentalists who say they are death on Jack Hyles. How is using these different strategies and new measures being ashamed of the gospel? We are ashamed of the gospel any time that we don't preach it when we should. And it should be preached to unbelievers instead of using these techniques. Someone might say, "Well, we do preach it later." But it shouldn't be later. It should be the technique and the strategy. Not doing so is to show shame for it, and I'm basing that on what Paul says in 1 Corinthians 1 and 2. On top of that, God doesn't get the glory. If that's what we're living for, God's glory, then that will matter to us. 19 years ago today, my only son and oldest child Kirk came into the world. I thank the Lord for him. He's been a joy and encouragement to me. Kirk lives thousands of miles away now, but I wish him a very, happy birthday at West Point, NY on the Hudson River, fifty miles north of New York City. We have the audio sermons coming on our church website again. You can listen and download both now at the same location. Just click on the sermon to get the download function. However, there is an audio player you can listen to right at the site. Also I've invited Thomas Ross to be a guest columnist any time that he writes something fit for What Is Truth. One article that I'm not going to print here, because I don't have Hebrew fonts or else I would, is this article that pertains to the King James Version. However, look for Thomas Ross articles here in the future. Still, we’re wanting to supplement individual outreach with corporate outreach more effectively than we have in the past. One idea I hope we can apply this year is a “Community Messiah Sing.” My intention is to schedule a time early in December in which we invite people from our community to gather at our church building (a) to sing popular portions of Handel’s Messiah together, unrehearsed and with no thought of a performance, (b) to have some refreshments, and (c) to hear a brief discussion of the history and theology of the great work, which will include a clear gospel presentation. We need to work on the details and viability of it. Have you ever done something like this? Do you have suggestions that would help make it more effective? Or do you have other ideas for outreach via this sort of community event? And I was against this? Am I the Scrooge? Was I one of those Philadelphia fans who booed Santa Claus? Am I William Safire's nattering nabob of negativity? Was I against singing Handel's Messiah? Of course not. I'm not finding it unusual for discussions to break down in this way. It's easier to debate the strawman. Or in the end, that I'm opposing the invitation of unbelievers to a Scripture recitation. OK. I'd rather not play that game. I refuse to follow that yellow brick road with its fictional characters. There's enough for people to judge, so they will need to do that. We should think about this, because a discussion about offering a community Messiah sing-a-long parallels with the question with which I titled this post. As long as the thing we are using to attract unbelievers to church isn't sinful, is it permissible? Is it wrong, does it violate God's Word, to use an attraction natural to unbelievers to compel an unbeliever to a church, to an assembly of believers? If the answer is "yes," then coffee, cappaccino, candy, soda pop, jumpers, parties, pizza, jet man, hockey, breakfast-lunch-supper, basketball, a rodeo, a zoo trip, a kite, a snow cone, a foot long hot dog, cotton candy, a dunking machine, a movie, water balloons, small toys, and even cash all are acceptable to attract an unbeliever to come visit. In principle, it is the same. None of these things are wrong or sinful. And since they are not wrong or sinful, then they are permissible to use to motivate an unbeliever to church perhaps to hear the gospel. If that is true, then why do these evangelicals and many fundamentalists have a problem with the methodology of Jack Hyles? In principle, they are not practicing different than him and his movement of fundamentalism. Hyles would have made the same argument, and Schaap still would, that is, if there's nothing wrong with it, then it should be fine to use to attract people to church. Music remains a big tool for churches to use to get unbelievers into their building. It isn't anything like that in the Bible, but it has become what churches use to motivate people to come to their church. Rick Warren himself in his Purpose Driven Church said music was the single biggest factor for the attraction of unbelievers, which is why he used pop as the music of choice. Some of you reading might say, "Well, I'd not ever use pop music in church." Great. But why music period? I do believe that the music program is often developed as an incentive for unbelievers---"come and hear our orchestra," "you'll really like our music," "our music is really good." That alone confuses people about what music is about. Should that matter? Should it matter that people don't know what church music is? That they think it is evangelistic? And then with that as a reason to come, it shouldn't be any wonder why church music is sliding downward. In this case, it is Handel's Messiah. Handel's Messiah, however, will attract a certain segment of unbelievers. That's the whole point of this pastor's promotion, which the fundamentalists that read his blog just ate up. Mainly I was attacked for disagreeing. I got no support in the comment section for opposing what he was doing. I'm on the board of two orchestras, so I know the classical music crowd. Many unsaved people are still interested in classical music. Handel's Messiah is beautiful art, very well done classical music. Many like singing it because of the sheer artistic value. I've been in the choir for The Messiah 7 times. I've heard it performed 7 other times. The Messiah fans are the crowd that the pastor who wrote the above paragraph was targeting. The promotion was the sing-a-long, something that we know communities are interested in, because they come together in the hundreds in places like San Francisco, where there are very few believers, to participate. People love the music. Sacred music has a prominent place in music history. Most of the world's great symphonies still play some of the wonderful music without having any interest in Jesus Himself. So the attraction isn't the recitation of Scripture, any more than a gigantic group gathered in downtown San Francisco for a free concert featuring an opera about Herod's murder of John the Baptist. I was there. People weren't interested in what John the Baptist preached. Should we explain what he did? Yes. Should we preach the Messiah of The Messiah? Yes. But should we invite unbelievers to come and sing The Messiah? No. They can't praise God. A church should see The Messiah as worship. They don't want unbelievers included in worship. I wouldn't ever invite an unbeliever to come and sing with us. I don't want him thinking he can worship. Ever. "But if we invite unbelievers to sing-a-long, we'll have an opportunity to preach the gospel to them?" It might work in that way. However, it is not truthful for us to give them any impression that they should come to a church to sing a song of sacred worship. It spoils the worship. It also sees music as evangelistic, which it isn't anywhere in scripture. And as an important side note, it is entertainment to them. They think it is entertaining. We know that. Perhaps most of all, however, if we want to preach the gospel to them, then we should just preach the gospel to them. You may say, "Well, they're not interested." Exactly. In the end, if they did get saved, someone will say it was because of the promotion, because of the neat idea. No it wasn't. It was because of the gospel. But you can see how that man is glorified through these types of ideas. They aren't in scripture. We think of them. Our idea worked! The Greeks seek after wisdom. The Jews seek after signs. Classical music afficianados seek after Handel's Messiah. Though I have heard it argued against many times, I am still not sure what the problem is with attracting people to hear the gospel. What else will we do? How else will they hear if we don’t attract them? Repelling them won’t work, and ignoring them hasn’t had great results either. It seems to me that people think “attraction=sin.” Attraction simply means getting their attention. If you aren’t baiting and switching (promoting the pizza party and then ambushing them with Jesus), I am not sure there is any biblical injunction at stake here. If you are substituting corporate worship for attractional evangelism, then I think you have a problem. But in reality, any personal evangelism takes place based on some type of attraction, whether personal or topical or conversational. To me the issue is what we attract them with and what we give up to do it. If we attract them with the Gospel, the relevance of the gospel to life, then I am not sure what the problem is. If we give up our corporate worship or teaching, then we have a problem. But if you don’t attract them, then what will we do to speak to them? How will they hear without attraction? Jesus doesn’t make attraction an issue. We go and cast seed. Whether people want it or not depends on the condition of their hearts—some stony, some thorny, some hard, some good soil. They won’t hear, not because we haven’t perfected the art of attraction, but because of the condition of their hearts. Nowhere that I know of does Scripture command us to attract unbelievers. We go and preach to them, mainly because they aren’t attracted. We’ve got to go to them, because they won’t come to us. We go into the highways and hedges to compel them, but it isn’t to compel them to come to church, but into the kingdom. What compels them? It isn’t natural attraction. It is supernatural power from the gospel. Let’s just say that I go out into my community and I say that it’s about the Jesus of the Bible—He’s Lord, He’s God, He’s Savior—and that’s what our church is about. I find out that people aren’t interested in that, in Him, even though Jesus is greater than anything. Paul said everything else was “dung” (Philip 3). I might be able to attract an unbeliever with a lesser thing, but if what I am offering is all about Jesus, why would I want to do that? If they don’t want Jesus, do we work up to Him by starting with things that the unbeliever wants that are less than Jesus? This seems to be carnal weaponry that won’t glorify God. In the long run, it will fall too, even if it seems to be working in the short term. I was softer on Larry than I actually was thinking about what he said. I happen to know that he has an M. Div. from a prestigious fundamentalist institution. What he said was very, very bad. Another interesting point is that these fundamentalists didn't even pick up on that. What he said sounded good to them, and several of them are even self-identifying Calvinists. I read a woeful lack of discernment there, maybe the old boys club where if you disagree too much you'll be on the outside looking in. Larry ends by asking this question: "But if you don't attract them, then what will we (sic) do to speak to them?" This seems so obvious as to be absurd. You can't speak to unsaved people without attracting them? I've been in what many would consider the hardest territory in the U.S. evangelizing for over twenty years. If you want to talk to them, you just talk to them. If they don't want to listen, that means they aren't interested in the gospel. They've got to want to be interested in the gospel. It seems plain to me from reading Larry's question that evangelicals and fundamentalists have been duped by some serious deception about evangelism. They think that you've got to help the gospel along with natural attractions, or maybe we could just call it what Finney did: "new measures." Larry would probably say he's death on Finney, but his question was fully Finney. The reason unbelievers won't listen isn't because they lack attraction. The gospel is attractive. It is the pearl of great price. If they don't want to trade their earthly treasures for it, then offering an earthly treasure as an incentive isn't right. Jesus answered why believers don't get the gospel in Luke 13:24. They won't strive to enter through the narrow gate. They won't agonize (the Greek word for "strive" is agonizomai). Jesus didn't try to make the gospel more attractive or attract people to it, however you want to say it. He just preached it. Christian leaders today know that professing believers don't want to preach, so they want to make it easier, so they have what they call "corporate evangelism." That sounds like a great term, very technical, but what is it? It's just mumbo-jumbo, gobblygook. Now if they meant, everyone in the church preaching the gospel to every creature---that is corporate evangelism---that would be great. But what they mean is that everybody comes together at church and the church arranges some shindig that they think unbelievers will like, and they invite them to it. It is bait and switch. The unbelievers aren't coming to hear the gospel. They are not. What you do with this is produce faithless people. You don't build them up to live for the Lord. You give them an alternative that is easier for them to do that isn't spirit-controlled boldness. I'll probably write a second one on this, because I think it is a good time to do it, so stay tuned. Our eyes aren't on the fashions and fads of the day and we're not interested in sacrificing long-term spiritual impact for immediate pop-culture relevancy. I think that John MacArthur thinks that. He hasn't stopped fashions, fads, and immediate pop-culture relevancy from moving into and all over his own church. Recently at the Pyromaniac blog, Phil Johnson, of MacArthur's church, advertised a conference of which he would participate. I clicked on the youtube promotion for the meeting. It's called the Psalm 119 Discernment Conference. To start, the ad itself has the fashionable, faddish, and immediate pop-culture relevancy, promoting the meeting about Psalm 119 with the rock music and the crumbling urban infrastructure, trendy and gritty, not separating itself from what is sensual and worldly, not differentiating itself from pop culture. You tell me. For "worship," they're having "Go Fish." I looked up Go Fish to find out what their "worship" was. You tell me what you think of their worship: http://www.youtube.com/watch?v=Wkc9-SvqfDM . I'm not going to give any evaluation other than this is mutually exclusive from worship. This is immediate pop-culture relevancy. This is what the conference attendees have leading their worship and this is where "worship" is today with the conservative evangelicals. The picture here is the "Go Fish" promo for their "worship" that they took in their "shoot." Discernment conference? They aren't encouraging it in worship, so what else could we hope for? Your thoughts. Please. With this post, I hope to provide some assistance in sorting out the blame for the United States national debt, which is over 12 trillion dollars, amounting to over $113,000 per taxpayer and over $40,000 per citizen. 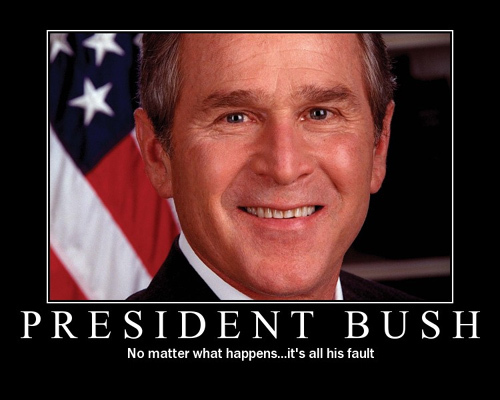 First, President George W. Bush deserves blame for the national debt. When he took office, the national debt was 5.7 trillion dollars. When Obama took office, the national debt was 10.6 trillion dollars. The nation racked up 4.9 trillion dollars of debt under the Bush presidency. As I heard someone characterize it---he spent like a drunken Marxist. Second, how does debt grow? Most of you know this. The national debt grows when our government spends more money than what it takes in. It is the same way your own debt increases. If the government spent no money, no debt would accumulate. The money the government spends comes from the federal taxes upon the United States citizens. Another way to avoid debt is to increase the total amount of taxes paid. If the government brings in more revenue than what it spends, debt will decrease. How to increase the revenue is a little more tricky than how to decrease the spending. What I have noticed in my lifetime is that governments that cut taxes increase government revenue. That doesn't make sense to some people. How could the government increase its revenue by decreasing taxes, when taxes are the only way a government can get money to spend? What I have witnessed is that the decrease of taxes results in the growth of the economy. More money is invested in private enterprise resulting in more production of wealth. Even though a smaller percentage of taxes are paid, the total amount of taxes increases because of the increased productivity and wealth. It's as simple as this: people work harder when they get to keep more of what they earn. When they work harder, they increase productivity and then wealth. However, for the sake of argument, let's keep the revenue side out of this. Some argue for raising taxes as a means of increasing revenue. Others contend that lowering taxes will raise the revenue. We all know that cutting spending will lower the national debt. There is no argument on that. Spending increased in the Bush government. He's to blame. Third, were President Obama and Vice President Biden also part of the government when George W. Bush was president? Yes, they were. They were two of the only fifty United States Senators, Senator Obama from Illinois and Senator Biden from Delaware. Barack Obama was a Senator in the United States Congress from January 3, 2005 to November 16, 2008. Joe Biden was a Senator during the entire Bush presidency. Fourth, did Senator Obama, and now President Obama, try to cut spending or did he vote to spend more as a Senator during those years of the Bush presidency? Congress does, if you didn't know it already, control the purse strings in our government. Money spending starts with Congress. The Senate is one house of the U. S. Congress. Certainly the president must approve of that spending, but no spending would occur without the Congress initiating it. Then Senator Obama was part of the Congress the last four years while Bush was president. The Democrats also controlled both houses of Congress after 2006. We know how Senator Obama voted as a Senator and he rarely voted against spending more money. When now President Obama was a Senator, he also often voted against spending cuts. The National Taxpayers Association reported that in the 110th Congress, then Senator Obama was by far one of the biggest spenders. If you just look at his time in the Senate in 2007, Obama voted "NO" to "To pay down the Federal debt and eliminate government waste by reducing spending on programs rated ineffective by the Program Assessment Rating Tool" on March 22, 2007. Just quickly scanning his record, he voted "YES" to additional spending on 3/7/06, 3/14/06, 3/15/06 (twice), 3/16/06 (six times), 4/3/06, 5/18/06, 3/23/07, 3/29/07, 6/6/07, 6/19/07, etc. So the answer is that, "yes," Senator Obama supported and contributed to the increase in the national debt. He was not a force toward shrinking the debt, but an encouragement toward growing it. Since President Obama became president, in a little more than a year the debt has increased from 10.6 trillion to 12.3 trillion. That's 1.7 trillion increase in national debt since Barack Obama became president. If you project that over his four years, he will have increased the national debt over 1 trillion dollars more in four years than what President Bush did in eight. Someone who complains and blames about inherited debt, who racks up debt the fastest in all history, is like someone who complains and blames about frowning, who has a permanent scowl on his face. The person who blames someone else about inherited debt, who multiplies the debt like no other, is like someone who complains and blames about boogers, when he's got boogers all over. You can put his face next to hypocrite in the dictionary. Fifth, no one who grows the national debt by supporting increased spending and then himself increases the national debt faster than anyone ever shall be able to blame anyone for increasing the national debt. All blame of others or predecessors by such persons shall be ignored. Menno, and Anabaptists generally, did not accept Luther's forensic doctrine of justification by faith alone because they saw it as an impediment to the truth doctrine of a 'lively' faith which issues in holy living. But in [rejecting forensic justification] they [the Anabaptists] undermined the very foundation of the biblical doctrine of justification. They left people to try to devise a righteousness of their own to those who believe (cf. Phil 3:9; Rom 4:5-6). Show me one anabaptist confession or treatise on justification that is sound & thorough enough to refute the Council of Trent. [T]hey were continually being persecuted, often fleeing, meeting in secret, and afraid to make written records that could fall into the hands of their enemies and be thus material for their condemnation. Most of their leaders were a "lay" ministry with little time to write because of making a living in a secular occupation, a circumstance diametrically different from the entrenched Roman clergy and later the Lutheran, Reformed, and Anglican full-time ordained literary-trained ecclesiastics. Anything written in a derogatory expression that would help to counteract [them] was valid. . . . While the New Testament Christians had neither time or opportunity to write church history, their enemies did, and they wrote to express deep animosity of the constant threat pure New Testament truth presented to them. Thank God, in the last one hundred years historian-scholars of most all denominations have by open historical research come to agree that the Biblical Anabaptists were terribly and falsely maligned by their opponents and that the actual truth is that they were a most noble, peaceable, harmless, exemplary people, a wonderful credit to Jesus Christ and remarkably different from the corrupt entrenched crowd that despised them. According to William Estep in his excellent, The Anabaptist Story (1975), Anabaptists could not be identified by any unifying creed, primarily because of their insistence on the primacy of Scripture. He shows how that Menno Simon was to have said that the church fathers themselves should be trusted only if supported by God's Word (pp. 130, 133) . Some men that were called "Anabaptist" surely made the Scripture secondary to the internal voice of the Spirit, leading to certain tragedies and a smearing of those who depended on the Bible for authority. Because the Anabaptists, differing from the Protestants and Catholics, did not depend on coercion and would not enforce unity by the sword, neither could they rely on those methods to unify some movement. Paul says to the Romans in the third chapter that they are all together sinners and come short of the glory which God should have from them, yet apart from merit, they shall be justified by his grace through redemption which Christ accomplished. Through the merits of Thy blood we receive the remission of our sins according to the riches of Thy grace. He has justified us out of grace without merit through the redemption that has taken place in him, Rom. 3:21-25. He has set before us the selfsame one as a mercy seat through faith in his blood, Eph. 1:5-8, and has included all those under sin in order that he alone may be justified and in turn justify all who have faith in Jesus Christ, Rom. 3:19-26. That all sounds like forensic justification. So where is the disconnect for George and Johnson? I think it is a couple of issues. First, a large majority of reformed historians were not trustworthy in their representation of the Anabaptists. Instead of relying on exactly what the Anabaptists themselves wrote and said, these men count on what so-and-so Mr. Reformed Historian has said that the Anabaptists have said even if they didn't say it. Either that or they broad brush all the Anabaptists based on the beliefs of some of the less orthodox who were also called Anabaptist. The magisterial reformers, the state church guys, expected submission and obedience from subjects of the state. They didn't like the Anabaptists because they wouldn't submit in state-approved doctrine, so they didn't mind slandering them or misrepresenting them. Second, the Anabaptists had a different emphasis in salvation than the magisterial reformers. Anabaptists put an emphasis on the new birth rather than the justification, stressing that the imputed righteousness would show up in a life of surrender. The Anabaptists saw a lot of unconverted-like behavior in the lives of the reformational leadership, let alone the rank and file. The reformed view of justification tied into their practice of infant sprinkling as well. Many of the reformation period were members of the state church and had not experienced conversion. For a taste of what the Anabaptists experienced, one need only look at what Baptists also faced in the American colonies from the state church of the Massachusetts Bay Colony. When George Whitefield came to the colonies to preach in the open air, most of the church members in Massachusetts were not saved. Third, and this is my opinion. The reformed and/or the Calvinists want to bring the non-reformed, non-Calvinist Anabaptist into disrepute. They do not want a non-Calvinist soteriology to look historic. They want the true Baptists to be the English separatists that came out of the reformation. You can see some of the venom coming from Johnson in a Twitter that he made shortly after the one he wrote above: "I've had a standing challenge to the Trail-of-Blood revisionists for more than a decade, and it has gone unanswered." There are several views of Baptist history, one being called the "Trail-of-Blood" position. Not everyone who believes in the succession of the New Testament church, based upon scriptural presuppositions, goes with the "Trail-of-Blood" per se, even if they do believe in a persecuted church. There is also the spiritual kinship position that was advocated by Thomas Armitage in his History of Baptists. Of course, Johnson also calls them "revisionists," which is parallel with calling them liars. Do you think that someone is revising history (lying) that makes a quotation directly from the Anabaptist's actual writings with page numbers included? Johnson needs to take a step back from his accusation. In 1527 Michael Sattler, the Anabaptist from the Black Forest, drew up a confession of faith in seven points. It was adopted by a secret synod of South German and Swiss Anabaptists at Schleitheim near Schauffhausen, as a binding Rule of Faith, and has become known as the Schleitheim Confession. The Schleithem articles are Anabaptism's oldest confessional document. It is first of all striking that these articles say nothing about God, Jesus Christ, and justification by faith. The central truths of the Christian faith are not mentioned. Why? Because the men who adopted this confession were in agreement with Luther and Zwingli concerning all of these central truths. Zwingli himself emphasized repeatedly that nothing involving belief in God, Christ, and grace separated the Anabaptists from him. The Schleithem Confession deals only with those points in which Anabaptism and the Reformation differ. That is the reason for the absence of the fundamental Christian truths. The seven articles deal with the church and the state, not with the center of the Christian faith. In faith in Jesus Christ as sole and sufficient Redeemer they were of one mind with the Reformers. If someone were to read the Schleitheim Confession and conclude that Sattler and the Anabaptists did not believe in justification by faith in Christ alone, he would also need to conclude that they did not believe in God or the Deity of Christ either. It is convenient to cherry-pick the "missing" justification by faith. It does show, however, a fundamental misunderstanding of the Schleitheim Confession. They were advocating their belief in justification by faith through its absence from that short Confession. The Schleitheim Confession recorded only the differences. So did the Anabaptists believe in justification by faith alone? Did they oppose the Council of Trent? Of course they did.